The earth is hotter than it has been in the past 2000 years and the largest ice shelf in the Artic has broken into two after having existed for 3000 years. But all that Russia does is procrastinate over endorsing the Kyoto Protocol -- the multilateral mechanism to check global warming (increasingly seen as the culprit behind such unprecedented occurrences). What is most perturbing is that Russia's arguments increasingly resonate those heard from the world's biggest polluter -- the us, that has already ditched the treaty. At the recently concluded World Climate Change Conference, held in Moscow from September 29 to October 3, the message from Russian president Vladimir Putin and his aides was that the country was not yet ready to ratify the treaty. "The Government of the Russian Federation is closely studying and examining this question, which is part of a complex of difficult and unclear problems," was all Putin had to say in his speech at the meet. It is unfortunate that Russia appears to be backtracking from its previous stand. A year ago, Russian Prime Minister Mikhail Kasyanov had stated at the World Summit on Sustainable Development that his country would ratify the protocol in the "very near future". More worrying are the informal remarks Putin made during the meet. At one point, he said: "People in Russia often say either in jest or in earnest, 'We are a northern country and a temperature 2-3 degrees warmer would not be scary, maybe it would be good. You would have to spend less on fur coats and other warm things.'" At another, he said "Some [Russian] farm experts say our grain output is up and will further rise, so thank God." This clearly indicates that there are those in Russia who feel that global warming is a good thing. How pertinent or influential these voices are cannot be judged at this stage. While some of Putin's remarks can be dismissed as having been raised in jest, the same cannot be said for the arguments put forth by his economic adviser, Andrei Illarionov. He argued during the conference that as Russia embarked on achieving Putin's goal of doubling the gdp within a decade, it would not be able to limit emissions and that no country had achieved such a feat in the past. He didn't mince his words while speaking to journalists on the sidelines. 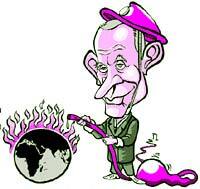 "The Kyoto Protocol will stymie economic growth," he is reported to have said. "It will doom Russia to poverty, weakness and backwardness." Comfortably placed Russia needn't, of course, reduce its emissions immediately. The protocol requires industrialised countries to reduce their greenhouse gas emissions by at least five per cent by 2012 from their 1990 levels. Russia's emissions are already 32 per cent below the 1990 levels. This significant decline is a result of the economic collapse of the former Soviet Union since 1989. According to the un Framework Convention on Climate Change, even at the highest gdp growth rate of 5.2 per cent, Russia's carbon dioxide (co 2 ) emissions will, until 2020, remain well within the limit specified for 2012 (see graph: No cause for concern ). Russia can even sell its excess quota of emissions to countries whose emissions are higher than the specified limit (that is, less than five per cent below the 1990 levels). This opportunity of selling its quota of emissions would give Russia a great chance to obtain financial investments. "Kyoto will probably mean Russia will be getting upwards of us $3-4 billion a year," said Andrei Marcu, the director of the International Emissions Trading Association, at the conference. Why then is Russia delaying its decision on the treaty? Bargaining chip? The Kyoto Protocol is dead without Russia and Russia knows this well. For it to enter into force, the treaty needs to be ratified by at least 55 members whose combined emissions account for at least 55 per cent of the global greenhouse gas emissions in 1990. Russia and the us alone account for 53 per cent of the global emissions in 1990. With the us having pulled out of the protocol in 2001, it is crucial that Russia, with 17.4 per cent of global emissions in 1990, ratify the treaty. So far, 118 members, accounting for 44.2 per cent of 1990 emissions, have ratified the treaty. Many believe that knowing it holds the key to the protocol's future, Russia is merely engaging in brinkmanship, trying to extort the maximum it can before signing on the dotted line. "Russia is delaying ratification, trying to get economic concessions, perhaps even entry into the World Trade Organization," avers John Lanchbery, head of climate change policy at the uk -based conservation group Royal Society for the Protection of Birds. But the eu has upped the ante, demanding that Russia raise its subsidised domestic energy prices as a pre-requisite for its accession to the wto. Calling it an"arm twisting" tactic, Russia argued, at the bilateral meeting with Germany on October 9, that doing so hurriedly would "ruin its economy". Experts warn that in trying to secure investment guarantees before it signs the treaty, Russia may do itself harm. Michael Grubb, professor of climate change and energy policy at the Imperial College in London, believes that Russia's hunt for investment guarantees from Western governments "betrays a worrying lack of understanding of the Treaty -- a classical disconnect between old-style international politicking and the realities of the market in carbon emission reductions that is established under Kyoto." Companies, and not governments, control investments. And these companies, seeking to make low-cost investments in return for guarantees of emission credits, will go elsewhere if Russia delays. Some, however, believe that Putin is facing a real problem in converting non-believers. The Canadian environment minister, David Anderson, interpreted Putin's comments about the Russian people's opinion on climate change as his way of pointing out that he had to overcome some very simplistic views. Putin also faces a more informed domestic opposition to the treaty from people like Vyacheslav Nikonov. The director of Politika Foundation, a Moscow-based independent think-tank, Nikonov questions the very science of climate change. "Scientists have failed to prove that the greenhouse effect [believed to cause global warming] is bad for this planet's climate," he says. He also feels that the actual financial gain to Russia is uncertain, given that an actual market to trade in emissions doesn't exist and the actual price per tonne of CO2 emission is unknown. Further, the us -- the biggest buyer (by virtue of being the biggest polluter) -- is not a part of the emission trading market. Then there are those who believe that Putin may be under pressure from the us. Having abandoned the treaty itself, the us would be pleased to see it fail. Whether it has a direct role in influencing Putin's decision can only be left to speculation. Remarks made by Illarionov at the conference, however, sound strikingly similar to the us' s arguments. His comments about the protocol being an obstacle in Russia's path to economic growth and the ineffectiveness of the treaty without the participation of big polluters like China are no different from the us's arguments. The us' gripe about the Kyoto Protocol exempting such developing countries as China and India from reducing their emissions is unfair, as these emissions are largely caused by activities geared to meet survival needs, whereas emissions in industrialised countries result mostly from the drive to meet luxury needs. Russia's decision to indefinitely postpone its verdict on Kyoto Protocol rules out the possibility of it coming into force before the next Conference of Parties to the un Framework Convention on Climate Change, scheduled for December, 2003. Although technically it would have been possible for the matter to be taken up in the Russian parliament before the end of its current session on November 20, officials are certain the protocol will not be discussed before the parliamentary elections scheduled for December 7, 2003.